Located on the central Union square, the Soldier Statue is dedicated to all the citizens who have their lives or their loved ones in the war. 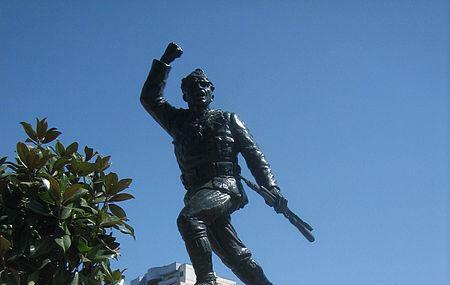 The monument consist of a soldier with a gun positioned to attack, standing on a pedestal that overlooks the square. On national holidays, you can find the statue adorned with flowers and bouquets at its base- a sign of respect that the locals still carry on with every year. Although just a small stop when in Brasov, take a photo here or simply stop by at the monument to leave a flower here during your walks through the city. A nice monument to the unknown soldiers of WWI. The square is a great place to glimpse the church of Saint Nicolas and the mountains surrounding the town. Necesita promivare si ingrijire mai mare! E foarte frumos asezat in Piata Unirii.Acolo se afla prima Scoala Romaneasca si multi nu stiu mormintul lui Nicolae Titulescu. O frântură din istoria poporului nostru . Merită vizitat !